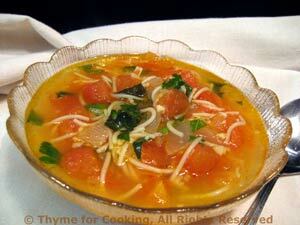 Fresh Tomato and Summer Herbs Soup, healthy gourmet from Thyme for Cooking. Hot soup, perfect for cooler fall evenings but, with garden fresh tomatoes, still has the flavors of summer. I used vermicelli, but any small pasta would work. Or you could use spaghetti, breaking it into 1" (2.5cm) lengths. Sauté in medium saucepan in olive oil over medium heat until soft and transparent, 7 - 10 minutes. Peel tomatoes and chop roughly. Add tomatoes to onion and garlic and sauté for 5 minutes. Add chicken stock and pasta, cover and simmer over low heat for about 15 - 20 minutes, depending on pasta, stirring every few of minutes so pasta doesn't stick. Remove from heat, add herbs, vinegar and serve. Note: To peel tomatoes blanch in boiling water for 30 seconds, then plunge into cold water. Peels should slip off easily.